So back in January 2013, the theme was Art. I loved this week. For four out of the five days, I recreated masterpieces from Mondrian, Kandinsky, Pollock, and Rothko. But on one of the days, I did something a little different. 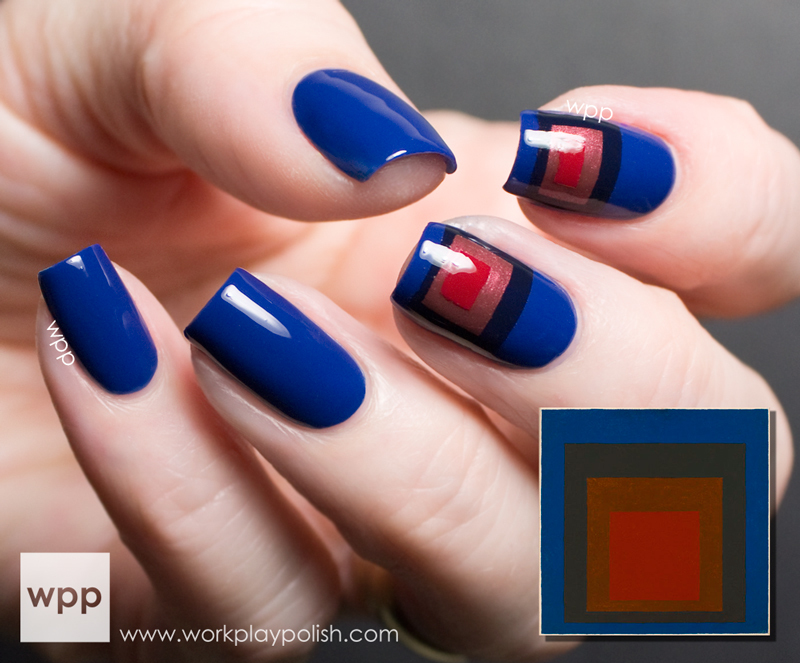 I'll share that mani and a fun fact after today's look modeled after one of Josef Albers' many homages to the square. I especially love this collection of work. The version I recreated is called Night Shades, painted in 1957. There's a thumbnail of the painting in the photo below. You can see a full picture of it, as well as his other "square" works by visiting the Josef & Anni Albers Foundation website. If you're a nail polish buff, the second you saw Albers' original, then the OPI San Francisco Collection had to be your first thought! Am I right? (Are we pathetic?) I used four shades from the collection: Keeping Suzi at Bay, Incognito in Sausalito, I Knead Sour-Dough and First Date at the Golden Gate. I used tape to make the squares on my pointer and middle fingers, layering one color over the next. 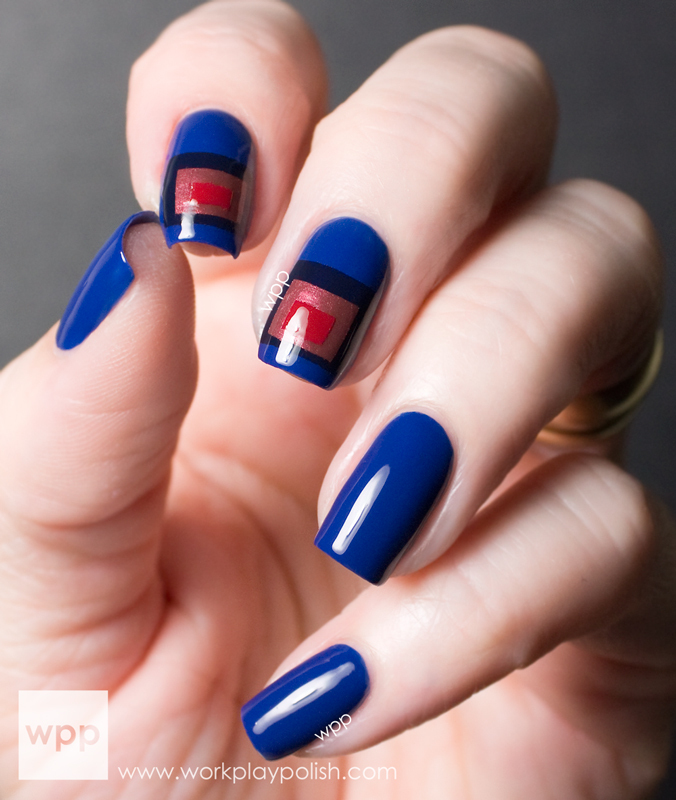 I love the simplicity of the design and I love that it combines colors that I would have never thought to put together in a nail art look. And here's my mani from January. 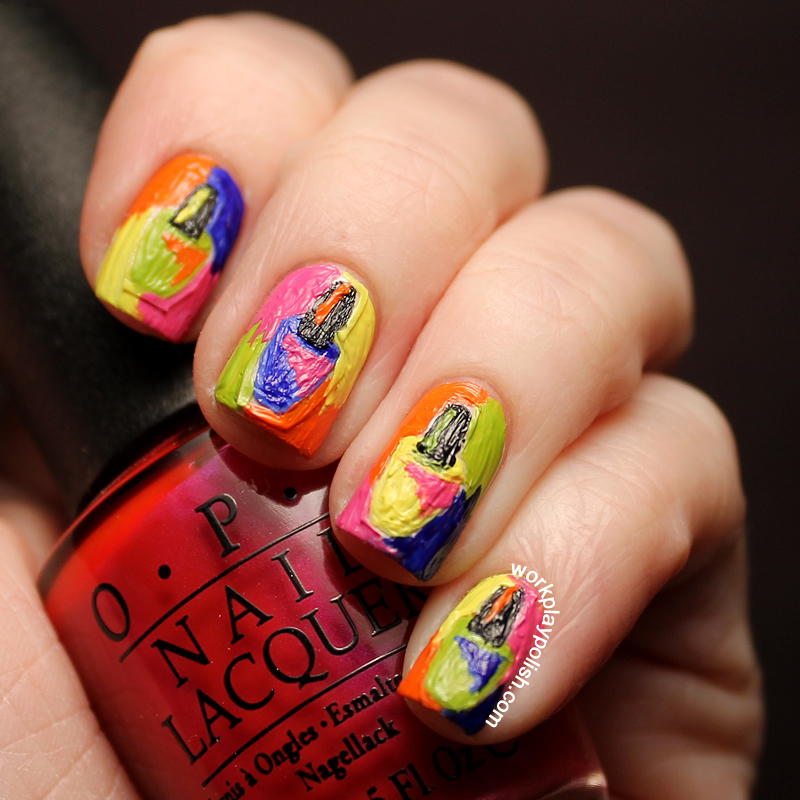 I used acrylic paint to recreate little Warhol-inspired OPI bottles on each nail (click the pic to visit the post). What's my fun fact? I tagged OPI in this pic on the WPP facebook and they commented that they had printed it out and hung it on the wall in their office!! Gah! Now mind you, that probably means that someone from OPI's PR firm actually printed it and taped it to their cubicle. But I prefer to picture it framed and hanging prominently behind Suzi's desk at the OPI World Headquarters! LOL. Soon after, I was accepted into OPI's blogger network...which was like a dream come true! The OPI San Francisco Collection is available now at Professional Salons, including Beauty Brands, Beauty First, Chatters, Dillard’s, jcp Salons, Pure Beauty, Regis, Trade Secret, ULTA and ulta.com for $9.00 ($10.95 CAN) suggested retail for each nail lacquer. For more information, follow OPI on Twitter @OPI_PRODUCTS and become a Facebook fan!